The two headline bouts at UFC 196 may have produced surprise results, but the popularity of the promotion shows no signs of slowing down anytime soon. Conor McGregor's bid to move up two weight classes ultimately ended in defeat, although anyone looking at the bloodied face of Nate Diaz would rightly wonder how it happened. Diaz eventually made the weight difference count, but aside from his pride being wounded McGregor's standing in the UFC hasn't really been affected. The Irishman's ability to 'sell' a fight saw almost 15,000 packing into the MGM Grand Arena in Las Vegas, and a gate of $8.1million placed the event third in the all-time list behind UFC 129 ($12.1million) and UFC 194 ($10.1million). McGregor's next move is unclear, with the fight giving his camp plenty to ponder. He fared well in the early stages against Diaz, but fighting a bigger man eventually took its toll. A featherweight title rematch against Jose Aldo would certainly capture the public's imagination, and with the Brazilian taking to Twitter to call out McGregor immediately after his defeat, it's a fight that president Dana White may want to make. While the loss may have bruised McGregor's ego, he was happy to have taken on the challenge of fighting at a higher weight. "I will never shy away from a challenge," McGregor said. "I will never shy away from defeat. This is part of the game. "I am happy to come out there, continue and stay in this fight. I had many chances to not do this and sit and wait. "But I went in, I took the fight and it didn't pay off. This is the fight business. It's another day. I'll come back." UFC 200 is the next showpiece event in the promotion's calendar, giving McGregor plenty of time to recover from this setback. Miesha Tate's defeat of Holly Holm in their bantamweight title fight has set up the mouth-watering prospect of the two biggest names in the UFC co-headlining at UFC 200. While a definite date for former champion Ronda Rousey's comeback hasn't yet been set, White may be unable to resist the temptation to build the event around the McGregor/Rousey axis. 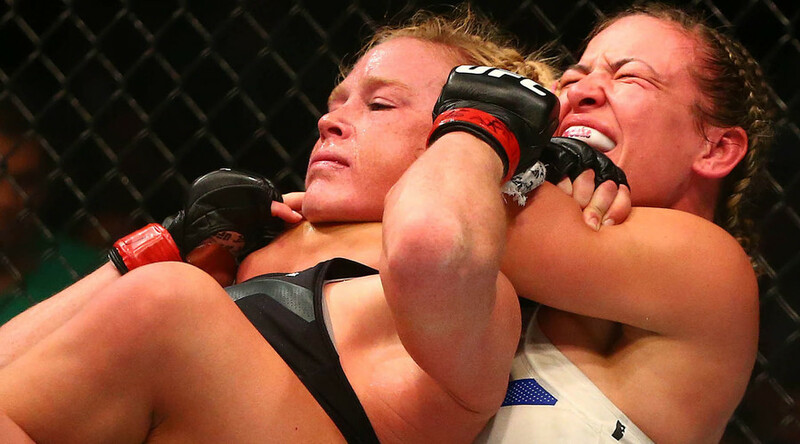 "I think that Ronda now will fight Miesha Tate for the title - that's what's going to happen," White said. "That's what I said before this fight even happened. Whoever wins tonight will fight Ronda for the title. "I text[ed] Ronda, and she said, 'What happened?' I said, 'Miesha just choked her unconscious.' She said, 'Looks like I gotta get back to work.'" Holm's defeat potentially leaves her on the outside looking in for the short term, but she says she aims to fight again soon. "I'll be training right away and I'll take the fight as soon as they'll give anything to me," she said. "It's whatever opportunity they'll give me right now. We'll see where they want to go with this. "If I have to fight somebody else to get there, if I have to fight my way back, that's OK too, because I'm OK and I can put in the hard work to do that. I'm willing to do that." With each passing event the UFC continues to deliver what the fans want - action. Last year's Floyd Mayweather v Manny Pacquiao fight was considered by many experts to be a snoozefest, and contrasted with the relentless pace in the McGregor v Diaz bout, it's clear they have a point. The UFC's fan base is growing fast with 1.2 billion households watching the sport in 158 countries during 2015. Recent events in London and Dublin sold out quickly, while a six-year $110m kit sponsorship from Reebok is a measure of how far the promotion has come. 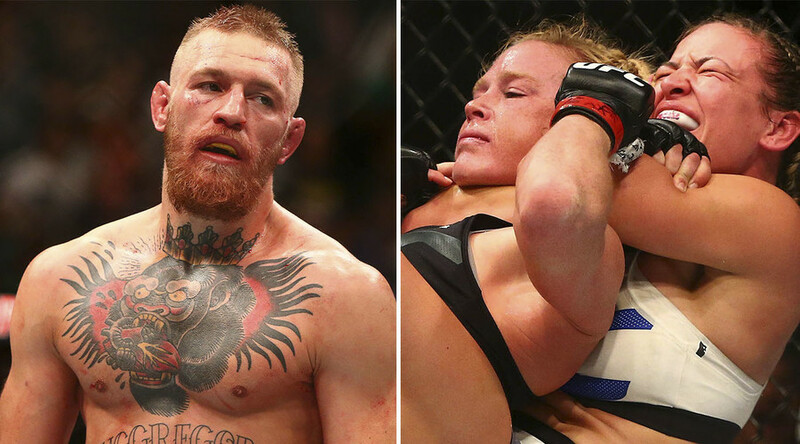 McGregor and Rousey as the star attractions at UFC 200 could finally propel the sport past boxing as the number one combat sport on the planet. It would certainly challenge the promotion's record number of pay-per-view buys of 1.6 million at UFC 100.